I love that I’ve received so many questions from followers about Beautycounter – specifically products for those of you who are just getting started with the brand. 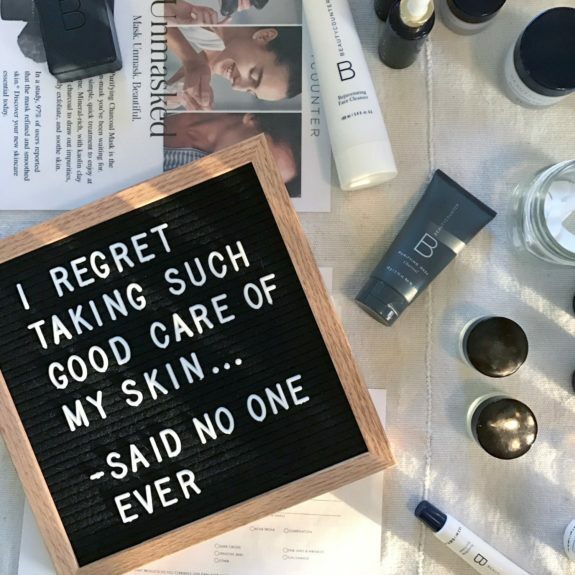 Beautycounter has A LOT to offer, but instead of overwhelming you with one million products recommendations, I’m going to share my top “starter” products (as well as personal favorites) with you. For anti-aging, I personally love the Rejuvenating Radiance Serum and have had great results using it. (The whole Rejuvenating Collection is awesome, but if I had to choose just one product to start with, it’d be the serum.) However, the Overnight Resurfacing Peel is another anti-aging product that clients are seriously loving. I JUST ordered it last week, but I’ve only heard GREAT things about it, and I’m excited to give it a whirl myself. I’ll be sure to report back! 🙂 I also use the Countermatch Recovery Sleeping Cream before bed and love how my skin looks in the morning! For make-up, I’m in love with the Dew Skin and recommend it to everyone – even family and friends in real life. I’m obsessed with it and just keep buy tubes of it – thankfully, it’s 25% off as a consultant! 😉 The Dew Skin has light coverage, SPF 20, and a little bit of moisture, so, most of the time, I don’t even bother with a separate moisturizer. It’s such a phenomenal hassle-free product! If you have specific skin care concerns (i.e. acne, pigment, dryness) or interested in learning about other Beautycounter products, please let me know. I’m more than happy to get more specific with my recommendations. Just send me an email at tinabeautycounter@gmail.com your questions or concerns! P.S. If you’re interested in staying in the loop about Beautycounter promos and sales, be sure to sign up for my Beautycounter newsletter! The post Beautycounter “Starter” Product Recommendations appeared first on Carrots 'N' Cake.